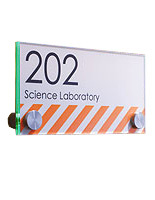 Green-edge acrylic face plates sized at 8-1/2" x 11"
This office sign that measures 8-1/2" x 11" is a complete signage solution. 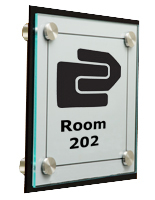 The lobby display is often used to detail room numbers or label specific areas throughout hospitals, college campuses, corporate buildings, and more. 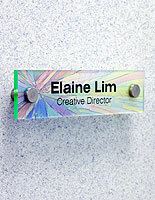 This office sign, also referred to as a directory system for name plates, is different from other signage options in that it allows for personalization. The customer simply designs custom graphics via a personal computer, and then prints them onto the provided film material. The office sign that includes printable sheets is then pieced together and installed with the supplied stainless steel hardware. 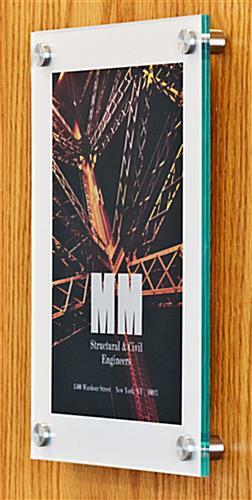 Door and wall applications are the most common, although any solid surface that is suitable for standoffs will work. 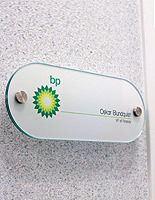 This office sign features upscale finishes and materials to fit in well with many corporate environments. 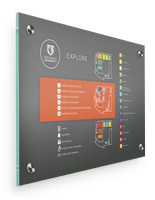 Mount in business establishments that require wayfinding or numbering systems for rooms. 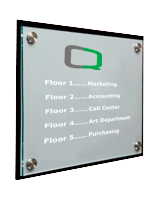 This lobby directory, office sign features contemporary green-edge acrylic, which provides the look of real glass without the high cost. The custom business display is actually one of the lowest priced solutions when compared to similar DIY signage systems. 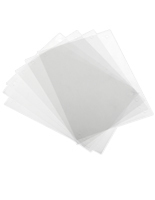 Each office sign includes two types of printable film: frosted and clear (for use in laser printers or photocopiers only, no inkjet). Users have the choice of applying either style because every purchase comes with (3) pre-scored sheets of each. In addition, the extra sheets allow for easy updates when information changes down the road. 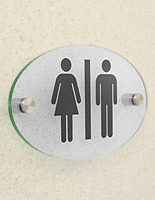 The office sign is simple to use, as templates for custom designing signage can be downloaded below. 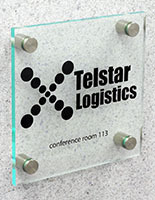 Once the graphics have been prepared, simply place them between the acrylic panels and mount the assembly onto a door or wall with the standoffs for a unique business fixture. 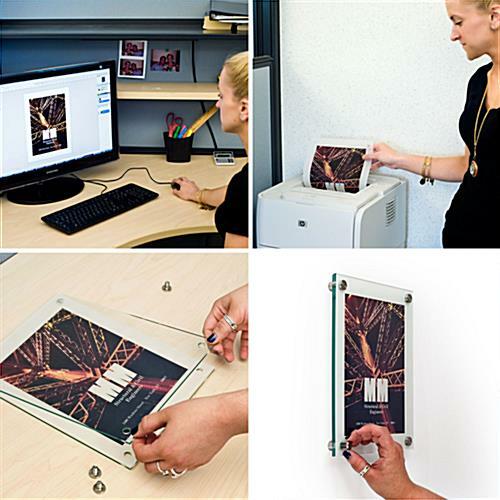 Try one of these do-it-yourself office sign kits today! We purchased 16 of these for a wall in our church. We call it the college wall and each acrylic features our students at various colleges in the area. It looks very sharp! That's such a nice way to use these, Andy! We're so happy they look so sharp! Thanks for the great review! I wanted my new office to look professional with some sort of door sign so I'm very happy that I came across Displays2Go. I was very pleased with my sign, thank you! We're happy you came across us too, Cristian! The sign looks great. Thanks so much for sharing a photo with us! Product arrived quickly and in good condition. Easy to assemble and use. These signs look great in our office! Super professional and I love that we have the ability to change them out ourselves. We're so glad these work well for you! We'd love to see a photo sometime if you have one! These Acrylic Plates were easy to install on our doors. Hi Dr. Watson! Thanks so much for taking the time to review and send us these photos! We always love to see how our customers are using our products. We hope you shop with us again soon!